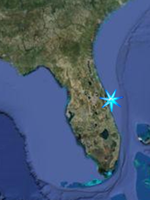 ﻿ Index of Freshwater Fishing Locations along Florida's Space Coast. Includes, Titusville, St. Johns River West of Titusville, Tosohatchee Preserve, Merritt Island National Wildlife Refuge, North Merritt Island. Includes areas west of Cocoa, and Melbourne including River Lakes Conservation Area on the St Johns River. Includes Palm Bay, Sebastian River, C-54 Canal, and the Upper St Johns, Stick Marsh, and Farm 13 areas within Three Forks Conservation Area and south to Lake Blue Cypress.